With so many talented bands out there, carving out a space in the jam arena can be a challenge these days. Just over a week ago though, I had the opportunity to play a show at Hank’s Pub with a sweet, new band called The New Outdoors, and these guys appear to be challenging the standard definition of jam a bit by mixing it with blues and a little twist of dirty, indie rock. This trio has only been playing together for about six months, and I was initially surprised to see them take the stage with no bass (just drums and two guitars). They ripped out an hour-long original set of tasty jams though like it was nobody’s business, and Sean O’Brien even switched it up to play bass late in the set! Andrew Shough’s chill vocals were the cream and sugar to my coffee, especially while also playing guitar. His rich vocals are a standout and would lend themselves well to any number of acts. Ryan Magner is the centerpiece, holding them all together on the drums and driving each tune exactly where it needs to go. Together, the trio’s relaxed, smooth jams have a little funk and a little blues guitar making The New Outdoors easy to groove too! The oh-so-smooth guitar leads and fills take it up a few notches, and there’s a killer dirty, grungy, and almost psychedelic sound to their tunes that take it to the interesting and intriguing and “I want more” level! These cats are hitting the Dayton scene right now, and YOU should make it a point to catch an upcoming show, or two or three! Razdabar Sound & Management Works to Connect Dayton Music! A little over a week ago, I had the privilege of meeting with Dawn Montgomery of local Dayton company, Razdabar Sound & Management, to talk about their efforts in connecting the local scene! I’d been seeing postings in local Facebook groups about their networking meetings in north Dayton that made me curious, but I had also heard that these meetings mostly involved the specific genres of rap, hip-hop, and R&B. However, when I met with local music & entertainment attorney, Melissa Replogle, in late April, she had mentioned that Razdabar was looking to expand their meetings to include as many genres as possible, so I got a hold of Dawn and we met at the Razdabar studio here in Dayton for a tour and a chat! From the opening notes of “Rainin’ Sunshine” right through to the end of “The Experience”, singer-songwriter Will Cook’s new solo album, “The Weatherman”, warms the soul and calms the storms of the mind. Byzantine at One-Eyed Jacks for $5 with local Dayton bands! 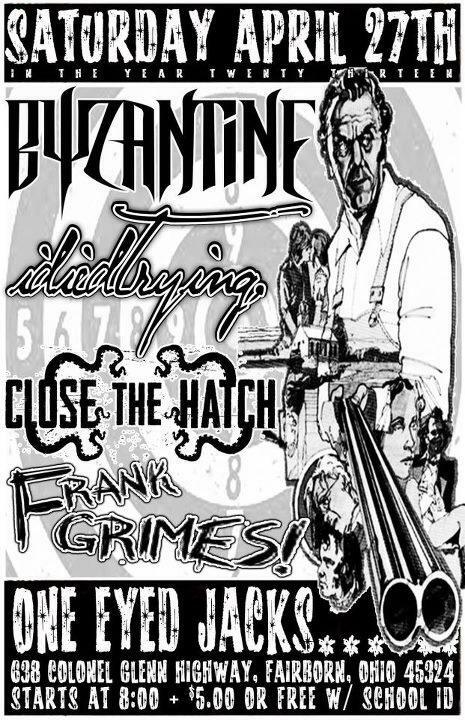 In case you didn’t already know… Byzantine is gonna be playing at One Eyed Jacks on 4/27 for just $5!!!!! and they’re playing with awesome locals idiedtrying, Close The Hatch, and Frank Grimes! This will be an awesome show that you don’t wanna miss! with Close the Hatch, Frank Grimes, and I Died Trying.